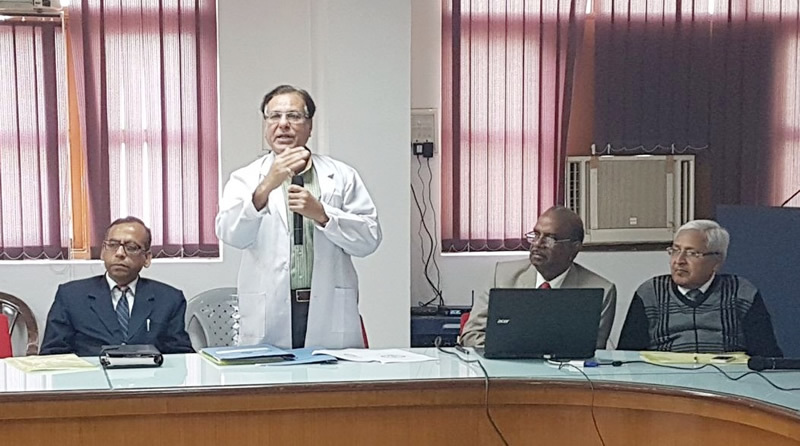 A meeting regarding Capacity building of Private Medical colleges for notification of every TB patients was held on 23rd February 2018 at Era’s Lucknow Medical College in which Principals, Medical Superintendents and Nodal Officer- RNTCP of Private Medical Colleges in and around Lucknow participated. Prof. MMA Faridi, Principal, Dean and CMS, welcomed all the participants and said that involvement of medical colleges in RNTCP is very important and 20% of cases are being diagnosed and contributed from the medical colleges. He further emphasised that every cases of TB being diagnosed and treated should be notified especially from the private medical colleges. Dr Alok Ranjan, State TB Officer (Uttar Pradesh), welcomed all the participants and requested all the principals and superintendents to improve the functioning of RNTCP in all the medical colleges including notification. Prof Rajendra Prasad, Head of Department (Pulmonary Medicine), Director Medical Education and Vice Chairman National Task Force RNTCP, Government of India while speaking on RNTCP update, said that RNTCP is a dynamic program and it has changed a lot in last 20 years, and now daily DOTS is being provided for all types of TB cases. He further added that out of 28 lacs of TB cases, only 14 lacs were notified from public sector and around 3.8 lacs TB patients were notified from private sectors between June 2014 and Dec 2015. It is a cause of concern that over 10 lacs patients of TB are still missing and government has no data about these missing cases. Out of 84000 MDR TB patients, only 32682 (39 %) were diagnosed and treated. Prof Prasad further emphasised that notification is very important and every patient of TB diagnosed and treated in private medical colleges must be notified. Dr. Saurabh Karmakar, Associate Professor, Pulmonary Medicine, Era’s Lucknow Medical College and Hospital spoke about the process of notification.